Shirley Lee has formal training and certifications as a facilitator. She enjoys helping people have effective meetings, idea generation sessions, and better decision making usng a variety of techniques. Shirley Lee enjoys helping leaders and teams develop good change management plans considering the transition required by those effected. She began working with teams on change issues after taking a course in Work Re-Design in 1994. Later she increased her knowledge by taking Implementations Management Association’s (AMA) Accelerating Change in 1995 and Arbineger’s Managing Results in 1998, as well, as receiving facilitation certifications and team training. 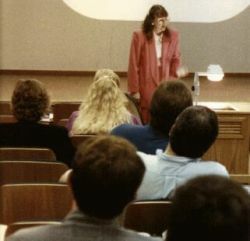 Shirley Lee received instructor certification for team-building courses in 1993 and 1995, as well as other employee empowerment and facilitation training. Shirley Lee has helped teams and individuals to become more effective in their work and plan for additional improvement and development. Shirley Lee has written internal communications and presentations for companies she worked with. She also has worked on the Dallas chapter of ASTD website, written articles for and proofed their newsletter since joining in 2000. In 2006 she served as Editor of their newsletter and their Webmaster . She has also had multiple articles she wrote published. Shirley Lee has been a Training and Development Specialist since 1986 and has experience in a variety of training and development areas. In 1992 she studied Technical Writing and in 1996 she completed One-Stop-Documentation training, which is designed to take training development from outline to manuals and finally to accompanying slide shows. Shirley Lee has been a Training and Development Specialist since 1986 and has experience in a variety of training and development areas. Shirley Lee has worked with various types of teams and leaders utilizing various assessments tools to find where they are and help them with planning where they want to go. Shirley Lee has been involved in many major project activities since 1986 including: information systems design, process development, and quality improvement. She began actively exercising the role of project team leadership and planning Project Management in 1993. Shirley continued to polish her skills and eventually started helping others to learn some project planning basics in 1996 through both seminars and self-teaching materials. Shirley Lee obtained Microsoft Office Master by getting Expert MOUS Certification in 2000 for four primary applications. She has developed Access databases for clients and Dallas ASTD, as well as Excel databases and forms in both Excel and Word. For information on MOUS certification, see Microsoft web site via www.mous.net. Shirley Lee was a Business Systems Analyst who has worked in various roles related to system implementation since 1984. Since becoming a consultant in 2000, she has also helped clients with system design, implementation, and training. Shirley has a BABA in Management Information Systems and has achieved Microsoft Office Master in the MOUS certification program. She has training in Managing Software Development. For information on MOUS certification, see Microsoft web site via www.mous.net.